Description: A tall bird with small, useless wings, emus are mostly brown in colour. They reach heights of 1.9m (6.2ft) and weigh between 30-55kgs (66-121lbs). Females are slightly larger than the males. Emus have long legs with 3 toes on each foot. A pouch in the throat allows the emu to communicate via a deep drumming sound which can be heard for 2km (1.2mi). 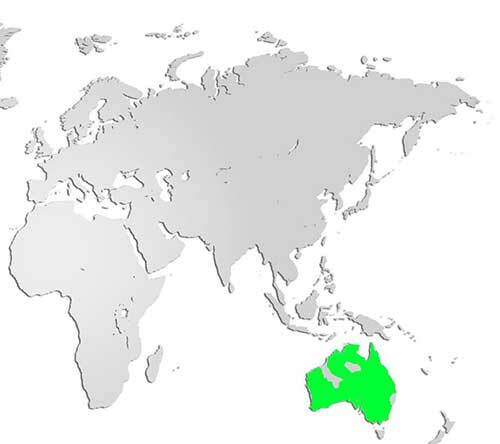 Distribution and Habitat: Native to mainland Australia, emus avoid urban areas, dense forests, and deserts. Emu farms are found throughout North America. 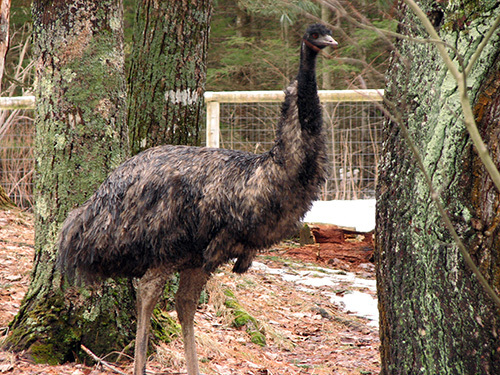 Diet: Omnivores, the emu diet varies depending on the season. They eat seeds, shoots, leaves, and small insects. Life Cycle: Usually a solitary bird, emus form breeding pairs in the summer and the female lays a clutch of 5-15 eggs in the fall. Emu eggs are large, weighing up to 650g (1.4lbs), and dark green in colour. Once the eggs are laid the female leaves and the male incubates the eggs for 8 weeks, moving only to turn the eggs. The chicks are ready to leave the nest about 3 days after hatching; they will stay with their father for up to 18 months. Did you know? The emu is the only bird in the world with calf muscles! These powerful muscles allow them to sprint at up to 48kph (30mph)! .